In a black October evening in 1864, eight families – forty people, in all were evicted from their holdings in the Townland of Portacarron. They huddled together on the roadside. Under the canopy of Heaven, with the rain pouring down in torrents, shivering infants lay in their mother’s arms, while others endeavoured to keep the fires lighted, to cook their provisions. 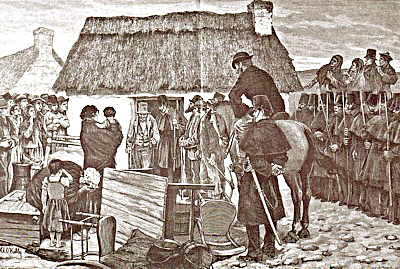 Captain John Phillip Nolan, the landowner, stood callously by, with his cousin Michael Nolan of Ballybanagher and witnessed the piteous scene. The evicted tenants were not permitted to carry away their roofs and timbers of their houses, as was usual in such cases. Two died as paupers in the Oughterard Workhouse; John Melia died on Holy Innocent’s Day, 1870. Another died after landing in America. Three others died broken hearted at home. The remainder were scattered about the county. The second eviction of four families, consisting of twenty eight people, took place in 1866.
Who was Captain John Phillip Nolan? John Nolan was a descendant of the Nolan family of Ballinderry, Cummer, Tuam. He inherited the lands in Portacarron from his uncle, Francis French. These lands were purchased in 1656 by the French family and were passed from generation to generation. Margaret French, sister of Francis, was married to John Nolan who was educated at Clongowes Wood College and Stoneyhurst, England. He attained distinction in his degree for his scientific and mathematical prowess at Trinity College. In 1857 his life as a solder began, when he was commissioned into the Royal Artillery at the age of nineteen. He invented the Nolan Rangefinder. This device enabled the soldier operator to estimate accurately the distance and therefore target any object. Until then, it could never be hoped to hit a moving target. Nolan received £6000 for his work. Because of his Nationalism, Captain Nolan was ostracised and boycotted in the army and was forced to resign. He returned to Galway in 1871 and sought to represent Galway in Parliament. Nolan asked his parish priest, Fr. Duggan of Cummer, to support him. Fr. Duggan refused until as such time Nolan made restitution to those whom he had capriciously evicted from Portacarron. A series of letters appeared in the press at this time, written by Fr. John Dooley, curate of Oughterard and Fr. Patrick Lavelle deploring the evictions. The cause of the evictions. There was no valid reason for the evictions other than that Capt. Nolan wished to set the townland to William Murphy of Oughterard, who was already in possession of nine large and extensive farms, in order to consolidate the whole place into one large grass farm. At the Easter session of the Clifden Court in 1865, Mr Thomas Brown, Capt. Nolan’s Agent, admitted that during the thirty one years he had been agent, he never met more punctual tennants in paying their rents. That they were most honest, industrious and peaceful. He also believed that they would pay an increased rent if desired. Capt. Nolan was also accused of charging his tenants for their crops of corn and potatoes sown by them in spring. Capt. Nolan’s version of the evictions differed in the sense that he maintained that he had no wish to consolidate his holdings. He maintained that his property was greatly subdivided for less than the Ordnance Valuation. Also the condition of his tenants had greatly deteriorated due to such unauthorised subdivisions. Capt Nolan forbade future subdivisions , through his bailiff Mr. Fahy. In later years Mr. Fahy subdivided his land and he was later dismissed. Capt. Nolan also stated that rent was often in arrears and on one occaision due to a harsh winter, no rent was collected. Whatever were the merits of the various arguments, it did transpire that when 3/5 of the whole townland became vacant, Mr Murphy proposed a rent 16% above the Ordnance Valuation. Capt Nolan eventually agreed to Murphy’s proposal and leased him the land for 31 years. Later on Capt Nolan realised that this was a mistake, but thought that this would aquit him of further responsibility as Portacarron was isolated from his main holdings at Cummer, Tuam. Some tenants remained sub tenants of Murphy, others refused and Murphy insisted on his legal right and evictions were carried out in the name of Capt Nolan, which he himself stated he could not then have legally refused. Honor Melia, representative of John Melia, deceased Thomas Melia, John Melia, Patrick Melia, Michael Fahy, Michael fahy Jnr., Patrick Fahy Thomas fahy, Michael Healy, Thomas Healy, Thomas Healy Jnr., Michael Gorman. It was an unusual course of action for a landlord and while it endeared him to his tenants. He was called a “Humbug’ by his peers, meaning he had deserted his class and denied the landlords right to unrestricted eviction. This page was added on 25/10/2010. The name – Fr John Wooley – should read “Dooley”, later Administrator at St.Joseph’s parish, Galway.